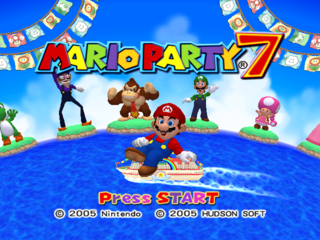 Mario Party 7 is the last GameCube Mario Party game. 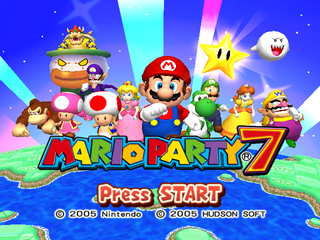 It features Mario Party mechanics, Mario Party boards, and Mario Party mini-games. Oh, and Toadette is playable from the start and there are two new unlockable characters. Other than that, it's Mario Party. You should know how this works. A rather unique 1 player Mic minigame, where the aim is to guide a mechanical Cheep Cheep into diving as deeply as possible down an undersea trench in 60 seconds, while avoiding spiked mines and the horizontal walls. Pressing the R button reveals a seemingly blank list, which in reality actually features 4 options which correspond to moving upwards, downwards, left or right in that order, all of which function as they should if selected. The mini-game ends if the Cheep Cheep collides with a wall or mine. NTSC-J Gecko Code to enter menu and to exit E3 Menu. 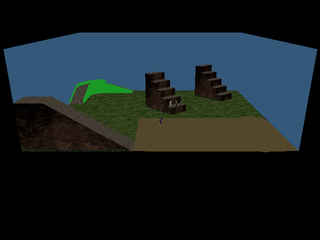 Choosing the "E3 SELECT" option in the debug menu (see next section) leads to a setup menu used in E3. Of course. You can also replace filesel.bin (data Folder) and fileseldll.rel (dll folder) with mde3.bin and mde3dll.rel, or use Gecko codes 0425728C 80257041 (NTSC-U) or 0425C6D4 8025C489 (PAL). Use the Gecko Code for your region to exit the menu. 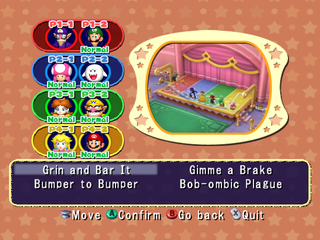 4-Player and 8-Player modes are selectable. 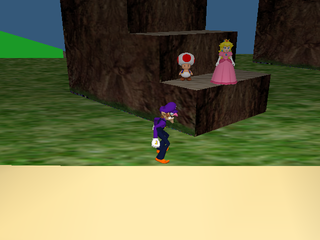 Toadsworth's text on this menu has been removed from the game, so he says nothing. The mini-game selection here is pretty limited. Replace w01bin (data Folder) and w01Dll.rel (dll folder) with selmenu.bin and selmenuDll.rel, or use Gecko codes 04257634 802571B0 (NTSC-U) or 0425CA7C 8025C5F8 (PAL). Start a new Party Mode game and select Grand Canal as the board. 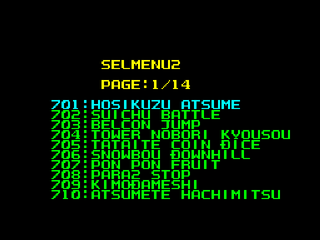 Once the game starts, you should boot into a debug menu! 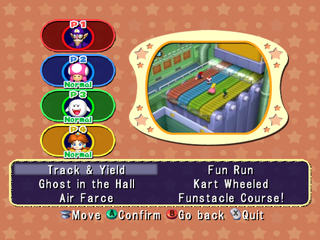 Same setup and font as Mario Party 4... which was just an update of the menu used in the Mario Party 1-3. It's been around for a while. Seriously. 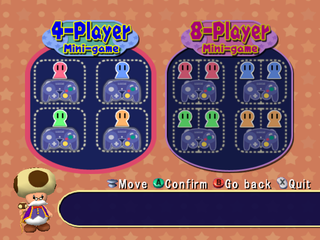 Unlike the previous three games, there is no character select screen before the mini-game starts. 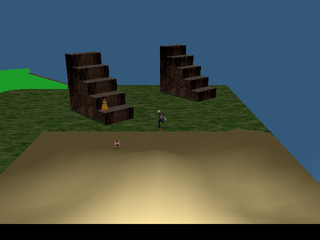 A test of character physics and the player's interactions with different floor types and other player characters. The stuff in the lower-right corner is sand. Characters will slowly drift towards the center of each pit. A test of all of the player characters' animations. The controls at the top of the cube are actually incorrect. Z Button: Load next animation. Try to hack in Blue Koopa Kid somehow. Add NTSC-J Gecko Code to play as Red and Green Koopa Kid for Upper-Left Player. 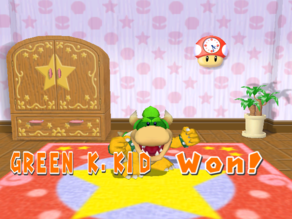 Using Action Replay codes, it is possible to play as the Red and Green Koopa Kids. For the Upper-Left Player, use Gecko Code 02290C48 0000000C (NTSC-U) or 022B3748 0000000C (PAL) to play as the Red Koopa Kid and use Gecko Code 02290C48 0000000D (NTSC-U) or 022B3748 0000000D (PAL) to play as the Green Koopa Kid. The character slot that should be Blue Koopa Kid causes the game to crash. They are missing several animations, have no voice clips, and their sound effects are replaced with Mario and Luigi's voice clips. 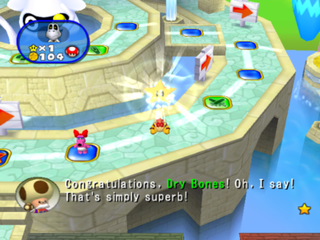 Additionally they seem to be suffering an identity crisis: while the result text in minigames correctly identifies them, they have a Coin or Bob-omb icon in minigames, appear as Mario in the Free Play Sub, a copy of the player across from them in the minigame rules screen, Dry Bones on boards in icon and text, and an empty string or icon in various other places. Gecko code 04005A1C 38C00002 will load the above title screen used at E3 2005 in place of the normal one. This texture is used when the current windmill owner in Windmillville is invalid and a windmill front is displayed like when viewing it in a model viewer. It says "Dummy". 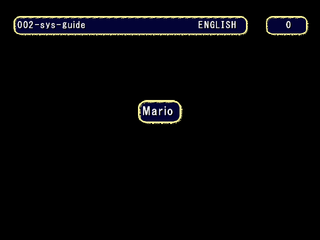 All codes are activated by using a mushroom for the NTSC-U version only. The Gecko code 042F0EE8 801FBED8 will activate a character space debugger allowing you to place any trap from any player on all blue or red spaces on the board simultaneously. This has no drop shadows or boxes at the moment. The below Gecko code allows you to change a variety of variables about the special orbs with pressing L+R simultaneously getting you back to the game. This has minor text overflow issues. The memory usage meters returns unchanged from Mario Party 5 and Mario Party 6. This can be activated with the Gecko code 0403D284 60000000 (NTSC-U) or 0403D258 60000000 (PAL). 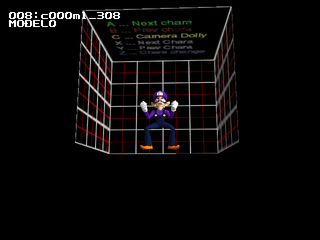 Its to remain unchanged in Mario Party 8. Enter the Gecko codes 0400CB04 60000000 (PAL) or 0400CB30 60000000 (NTSC-U) and you will see the screen surrounded by red borders which specify the region of the screen that is safe for UI elements to use. The borders specify that within 16 pixels from the horizontal edges and within 40 pixels of the vertical edges are not safe to use. This page was last modified on 6 September 2018, at 20:07.